Hybrid diamondlike carbon (h-DLC) coatings for multispectral use combine the hardness of protective DLC coatings with the multispectral functionality of high-end IR coatings. 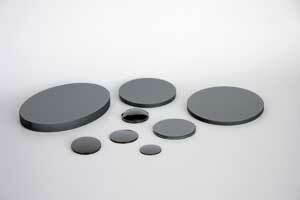 Optical coatings are used in numerous industrial applications for optical components. Besides the optical properties, the mechanical properties of these coatings play a significant role in the functionality of the optical component. Thin layers made of amorphous hydrogenous carbon (a-C:H) have outstanding mechanical characteristics, including high hardness, and therefore have a high environmental resistance. However, their optical performance is limited because of the single-layer design of these thin-layer coatings. 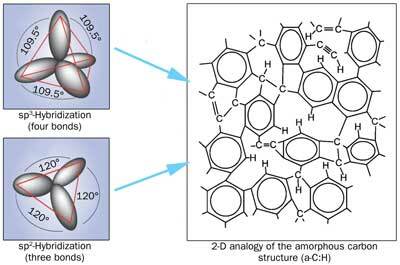 Amorphous hydrogenous carbon is generally known as diamondlike carbon (DLC). This term was originally established to point out the very high hardness of these types of coatings and to distinguish this technology from other types, such as graphite coatings. Figure 1. 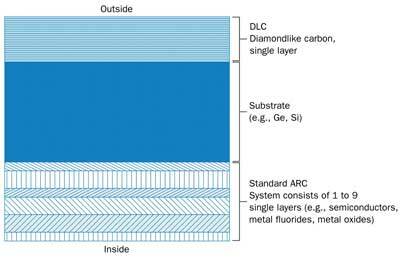 Standard single-layer diamondlike carbon (DLC) coating compared with optimized antireflection coating (ARC). DLC coatings are vital to optical systems because of their chemical and mechanical characteristics and IR transmittance as coating material for filter and antireflection layers. Other characteristics of a-C:H coatings include high abrasion resistance and transmission in the infrared wavelengths; the coatings also are chemically inert for corrosive chemicals, organic solvents, and concentrated acids and bases. Because of these properties, other industries have found applications for a-C:H coatings; e.g., the high hardness, abrasion resistance and low coefficient of friction make a-C:H layers an ideal surface treatment for automobile transmission parts and hand tools. Because of their chemical resistance and biocompatibility, a-C:H layers are compatible with artificial joints in human medical applications. DLC coatings play a significant role in optical systems because of their mechanical and chemical properties and their infrared transmittance as coating material for antireflection and filter layers.1,2,3 However, the optical performance of a DLC coating is similar to that of a single-layer coating, which limits the overall performance of an optical system. Figure 1 shows a standard DLC setup. Figure 2. Layer setup of single-layer DLC coating. Minimal reflection can be optimized only at a specific wavelength, thus narrowing the working bandwidth of the optical system. A look at other commonly used materials for conventional single-layer infrared coatings also shows a large disparity between the mechanical properties and the spectral performance of these materials. Dielectric materials such as fluorides (PbF2, ThF2, BaF2) and chalcogenides (Sb2S3, ZnSe, PbS), which have outstanding optical properties, offer low hardness and environmental resistance. Oxide materials have significantly better mechanical properties; however, because of their high infrared absorption, they can be used only in very thin layers. Semiconductor materials such as germanium and silicon, commonly used in infrared coating systems, offer only moderate mechanical properties. The process for applying single-layer coatings is very stable, but their spectral performance is limited as a result of simple physics. 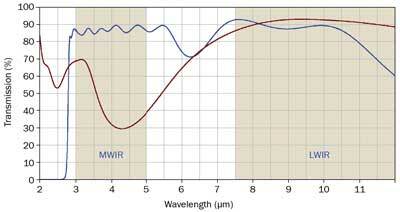 For example, for a single-layer antireflection coating (ARC), minimal reflection can be optimized only at a specific wavelength, significantly narrowing the working bandwidth of the optical system (Figure 2). This is a key advantage of multilayer coating designs, which enable a much broader working bandwidth. Figure 3. 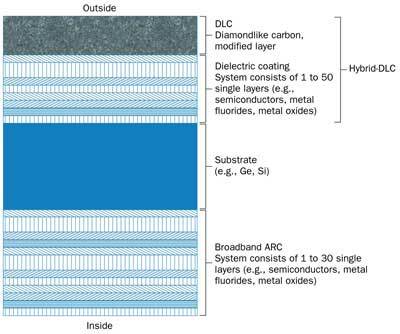 Layer system of hybrid-DLC coating. This multilayer system has up to 50 layers on each substrate surface. The development goal for the h-DLC-ARCs was to improve the spectral performance over the mid-wavelength IR (3 to 5 µm) or long-wavelength IR (8 to 12 µm) wave bands, for the substrate materials germanium and silicon, over the performance provided by a standard DLC single-layer application. A multilayer system, with up to 50 layers on each substrate surface, using the described approach is shown in Figure 3. Figure 4. Hybrid-DLC without adapted coating parameters after rubber and wiper test. Standard parameters were not sufficient for adhesion between the a-C:H and dielectric layer. The complexity of this design, and the material mix, led to new approaches in technology development. Standard parameters were not adequate for adhesion between the a-C:H and dielectric layer, as shown in Figure 4. Using the established standards TS 1888 (windshield-wiper test) and MIL-C-48497A as testing directives, the coating passed the tape and boil tests but failed the abrasion and wiper tests, two of the main benefits of a DLC-coated optical component. Therefore, new parameters had to be established. The combination of a hard (DLC) layer and a soft (dielectric) layer system on a thermally expanding substrate material led to some technical challenges. At issue were the grid tension between the substrate and the coating (stress resulting from the different thermal coefficients of expansion between the substrate and the coating), the “eggshell effect” of the layer system, the tension between the dielectric and the a-C:H layer, and the adhesion of the a-C:H layer to the dielectric layer (Figure 5). Figure 5. Impacts/influences while combining a multilayer dielectric layer system with a single-layer DLC coating. The eggshell effect can occur with a material stack where the outer layer is significantly harder than the inner layers. If force is applied from the outside, the harder outer layer, or “shell,” cracks, while the inner layers remain intact. To address these problems, adjustments first were made to the hardness of the DLC and the dielectric layers to eliminate the eggshell effect and tension difficulties. The biggest focus was to adjust the hardness of the DLC relative to the rest of the coating system, increasing the DLC layer’s elasticity while retaining its mechanical properties. Figure 6. Carbon bond structure. Carbon’s chemical composition is where the softer three-bond and harder four-bond characteristics show up. It was found that the hardness and elasticity (E-module) correlate in a defined manner. For DLC layers, a ratio between 0.1 and 0.16 generated the best results. The chemical composition of carbon (Figure 6) is where the softer three-bond and harder four-bond characteristics are shown. By adjusting the arrangement of these two bonding types, the desired ratio of hardness to elasticity was achieved, and the eggshell effect was eliminated. The challenge of adhering the different layers to each other and to the substrate was solved using specific buffer layers that support the adhesion between the different elements with their diversity in surface properties. Figure 7. 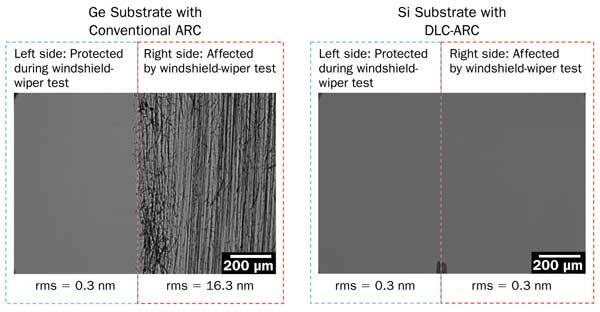 Standard and hybrid-DLC coated substrates after windshield-wiper test according to TS 1888. After overcoming the described material behaviors regarding adhesion, tension and hardness/elasticity, the coating performance was then proved in application usage, and the process was shown to be repeatable in a manufacturing environment. Figure 7 shows the results achieved after adapting the coating parameters on silicon substrates. Figure 8. Comparison of the measured reflection of DLC and hybrid-DLC in the 7.5- to 11.5-µm spectral range. 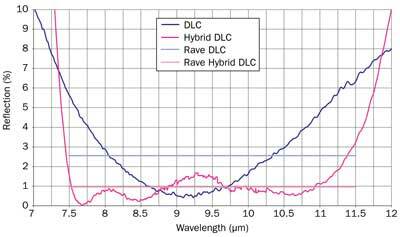 Because the idea for h-DLC has its roots in the improvement of optical properties of standard DLC coatings, the following measurement was taken from two coated substrates to show the optical effect of this new technology. Although a standard single-layer DLC has an average reflection of 2.6 percent for the long-wavelength IR spectral range, it could be lowered with the multilayer system to a value of 0.95 percent (Figure 8), which would lead to a higher degree of efficiency and fewer reflections (“ghosts”) inside an optical system. 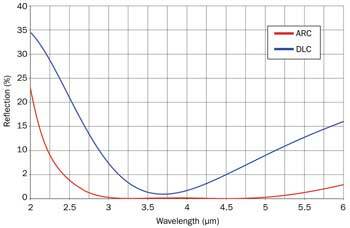 Promising results from the h-DLC development and different customer requests have led to the idea of applying a highly durable filter function to the optical surface. This provides even more possibilities to optical and system designers by having a preoptimized optical surface that filters the spectral range related to the performance of the system; for example, for recently developed dual-band applications such as infrared image-guided systems (Figure 9). Figure 9. Hybrid DLC has been developed for dual-band (MWIR [mid-wavelength] and LWIR [long-wavelength infrared]) applications, including IR image-guided systems. This means that an optical element that used to provide protection with only a narrow AR window can now be used as a multifunctional tool including protection, a broadband AR window or a dual-band filter, which leads to higher performance and potentially fewer optical components in the lens system, saving optical design space and weight. Michael Degel is product manager for infrared optics and systems at Jenoptik Optical Systems in Jena, Germany; email: michael.degel@jenoptik.com. Elvira Gittler is business manager of IR coatings at Jenoptik; email: elvira.gittler@jenoptik.com. 1. O.M. Kutsay et al (2001). Diamond-like carbon films in multilayered interference coatings for IR optical elements. Diamond and Related Materials, Vol. 10, pp. 1846-1849. 2. Y. Pan et al (September 2009). Design and fabrication of ultra broadband infrared antireflection hard coatings on ZnSe in the range from 2 to 16 μm. Infr Phys Tech, pp. 193-195. 3. J. Robertson (May 2002). Diamond-like amorphous carbon. Mat Sci Engr: R: Reports, pp. 129-281. 4. X. Yao et al (June 9, 2006). Infrared durable protective/antireflection coatings with high performance on Ge and Si substrates. Proc SPIE, Vol. 6149. 5. Ingmar Brenosch, Jena (2012). Research on the optical and mechanical performance of hybrid amorphous hydrogenous carbon layers on germanium optics in the infrared spectral range. Student thesis.